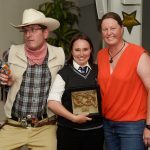 Pippi Longstocking, Minnie Mouse and Peter Pan all made an appearance at Leeuwin Ocean Adventure’s Spirit of Leeuwin Volunteer Award Night on Friday 14 September. 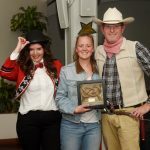 The ‘Movie Magic’ awards night, held at the Fremantle Italian Club, saw all of Leeuwin’s volunteers come together for an evening of fun, food, recognition and celebration. Leeuwin Ocean Adventure’s Chief Executive Officer, Carol Shannon, explained that volunteers are the back-bone of the organisation. “Without our volunteers, we wouldn’t be able to run our day sails or voyages,” she said. The Spirit of Leeuwin Volunteer Award Night is an opportunity for Leeuwin to say thank you to their volunteers for their commitment over the 2017/18 sailing year. Sisters Nikota & Tehya Scholz live in Crossman, but the 1.5 hour journey to Leeuwin (based in Fremantle) doesn’t stop them from lending a helping hand! Tehya (16) participated in her first voyage at the end of 2016, and has since completed 2 training voyages, 15 day sails and a 3-day voyage as a volunteer. Nikota (14) followed in her sister’s footsteps, participating in her first voyage at the end of 2017, and has completed 2 training voyages and 4 day sails since as a volunteer. 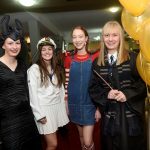 Both sisters have also dedicated hours of their time to volunteer at refits (ship maintenance periods), career expos, and the Leeuwin Maritime Industry Ball. Mother Nichelle Scholz said Nikota & Tehya feel valued by Leeuwin and look forward to volunteering, not just to help out and learn new skills, but also to catch up with the friends they have made. “The girls have a lengthy daily commute to school and live in a small town so are limited in opportunities for extra-curricular activities. Volunteering really gives them a sense of greater self-worth as they feel they are able to give back to Leeuwin for the opportunities they have received through the organisation,” said Nichelle. To find out more about Leeuwin Ocean Adventure volunteering opportunities email volunteer@sailleeuwin.com or visit www.sailleeuwin.com.